The financial crisis and the ensuing recession exacted a high cost on the country. Real gross domestic product (GDP) declined by over a half of a trillion dollars. Total nonfarm payroll employment declined by 8.7 million jobs, and 5.8 million households lost their homes to foreclosure. Extraordinary fiscal and monetary policy efforts were required to prevent a collapse of the financial system and the onset of a world-wide economic depression. In the aftermath, new regulations, such as Basel III and the Dodd-Frank Act, were implemented to strengthen the financial system and to limit the risk of a future financial crisis. Some opponents of tougher bank regulation claim that the increased regulatory requirements, such as the higher capital requirements and new liquidity standards, that have been imposed on large financial institutions in the aftermath of the financial crisis have reduced these firms' market-making capacity. As a result, so the argument goes, this is leading to less liquidity for trading securities, and to more illiquidity events in which the prices of financial assets move sharply and become temporarily unmoored from their fundamental valuations. The contention is that higher liquidity costs and more frequent illiquidity events will, over time, drive up the borrowing costs of households, businesses and the U.S. government; and that this is a substantial, largely unintended cost imposed by tougher regulation. Thus, the argument concludes, the regulatory burden should be rolled back. This is a noteworthy assertion and would have significant implications for regulatory policy if it were correct. However, as I will lay out in my remarks, I don't think the hypothesis is well-supported by the available evidence. First, the evidence to date that liquidity has diminished markedly is, at best, mixed. Second, even if one were to interpret the evidence as indicating that liquidity has been reduced, it is not clear whether regulation is the primary driver, as other changes have played important roles as well. Moreover, even if higher capital and new liquidity requirements were found to result in greater transaction costs, these costs would need to be assessed against the benefits of having a more robust and resilient financial system and a reduced risk of financial crises in the future. That said, more work should be undertaken to fully assess this issue. There is much that is still unknown. The available market liquidity data primarily focus on the inter-dealer markets and thus do not shed light on possible liquidity changes between dealers and customers. In addition, the financial system is adjusting in complex ways in reaction to regulatory, technological and other changes. We need to better understand the degree to which any changes in the nature of liquidity reflect the evolving structure of financial markets, changes in regulatory policy or other factors. With respect to regulatory policy, an important objective should be to achieve the best balance between the benefits of increased safety and soundness versus any costs imposed by these regulatory changes on market function and liquidity. In my remarks today, I will focus on market liquidity rather than funding liquidity, although I recognize that the two are related in important ways. I will examine market liquidity in two important fixed-income markets—the U.S. Treasury market and the U.S. corporate bond market. 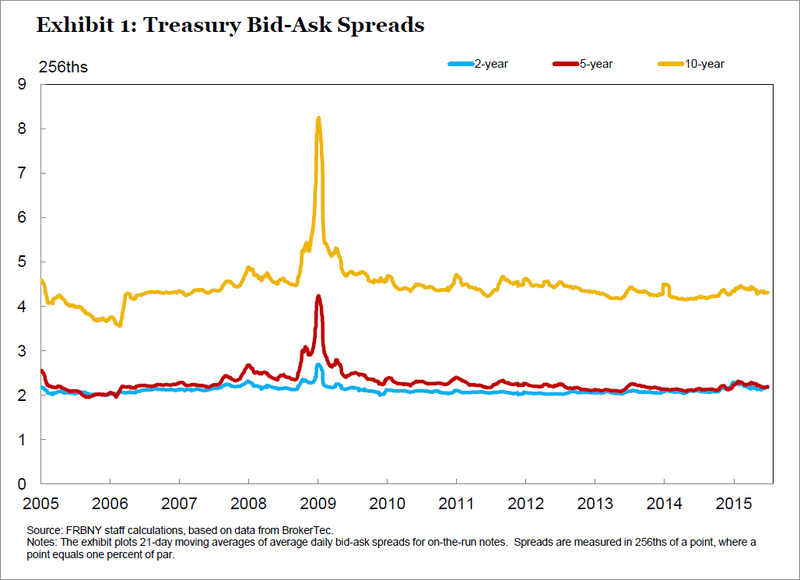 The Treasury and corporate bond markets provide a useful contrast in evaluating liquidity conditions as they differ with respect to the homogeneity of their securities, how their securities are traded and how regulatory changes may have affected the incentives of dealers to make markets in these securities. The Treasury market is much more homogeneous and the average size of each issue is much larger. Trading volume and average trade sizes are much larger, and much of the trading activity for interdealer on-the-run securities is conducted electronically through the use of central limit order books (CLOB). In contrast, the corporate bond market is much more heterogeneous; there are many more distinct bonds available; and bond sizes are much smaller. As a result, corporate bond trading is fragmented across a large number of distinct outstanding bonds. Consequently, trading tends to occur infrequently and largely on a bilateral basis. What do we mean by liquidity and how can we measure it? I would define liquidity as the cost—both in expense and in time—of buying or selling an asset for cash. This would incorporate any direct transaction expense, such as fees or brokerage costs, the price the transaction was executed at relative to the midpoint of bid-ask spreads, how much—if at all—the size of the transaction moved market prices, and the immediacy or speediness with which the transaction could be completed. How quickly prices revert back to earlier prices after a large trade also is relevant in assessing liquidity costs. The costs of liquidity would go up if the costs of execution rose, the bid-ask spread widened, if prices moved more in response to a given sized transaction or if it took a longer period of time to complete the transaction and receive cash. In assessing liquidity, we also need to distinguish between those liquidity conditions that generally prevail versus those that arise during periods of market stress when liquidity may become constrained. Liquidity risk is the risk that liquidity might be impaired in the future when one wants to buy or sell an asset. If liquidity risk is high, this means that there is a substantial risk that the price received could be at a greater concession to the prior trade than anticipated. Liquidity is dynamic, unobservable and multi-dimensional in nature, and, as such, can only be measured indirectly. We can measure liquidity using a number of metrics, including bid-ask spreads, market depth and price impact. 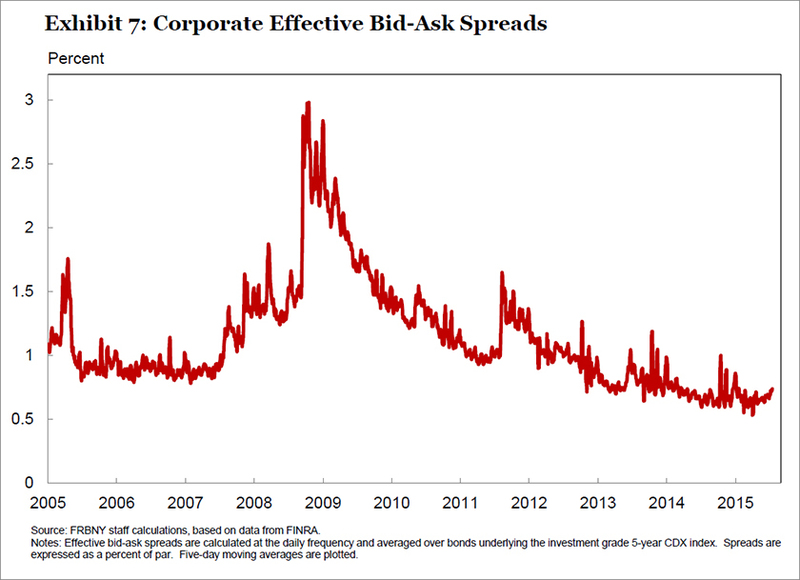 Bid-ask spreads are a measure of the potential compensation for market makers for liquidity provision. Market depth measures how thick the central limit order book is at any point in time. If the CLOB is denser and thicker, then a large trade should result in a smaller price concession, everything else equal. Price impact measures how the price of a security changes in response to trades of a given size. To measure liquidity risk, we combine the various measures of liquidity discussed above into a single liquidity index. Large jumps in illiquidity are identified as days in which the liquidity index deteriorates by an unusually large amount. We benchmark this as moves of greater than two standard deviations. Liquidity risk is calculated as the number of such jumps in illiquidity over a two-year rolling window. Constructed in this manner, we are implicitly assuming that the risk of an illiquidity event in the future is correlated with the frequency of such illiquidity events in the recent past. 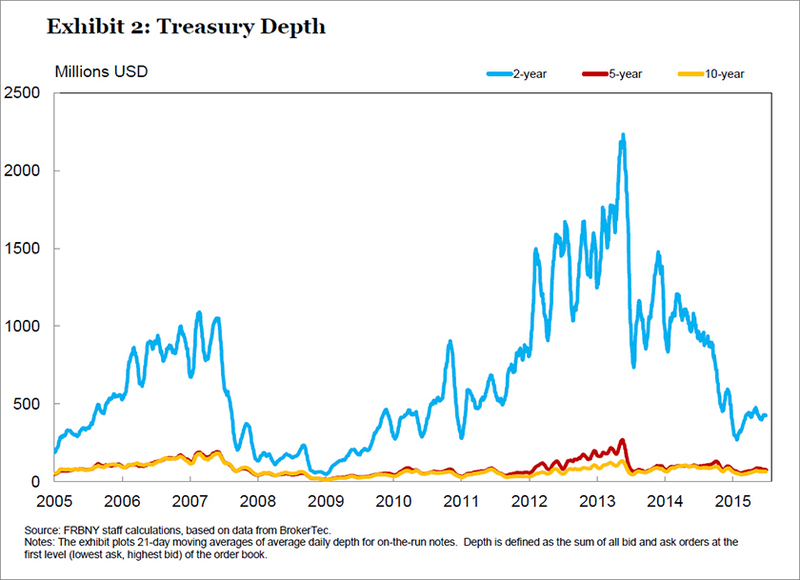 What does the available evidence show in terms of how liquidity has changed in recent years in the U.S. Treasury and corporate bond markets? 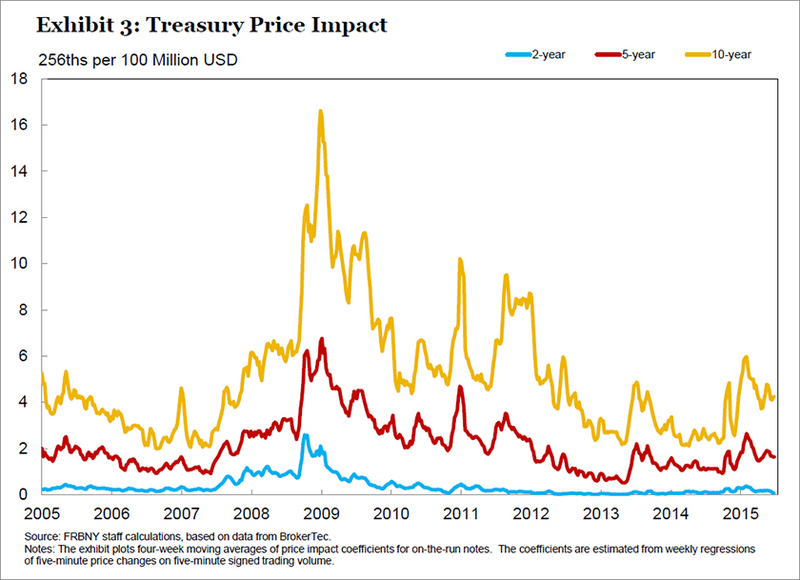 Another way to assess liquidity conditions is through the potential impact on Treasury yields. If liquidity had deteriorated markedly, then we would expect to see larger deviations of actual yields compared to the yields predicted by an empirically fitted yield curve. If liquidity were more costly, the deviations of actual yields from fitted yields would increase because the costs of arbitrage to eliminate those divergences would be higher. During the financial crisis, for example, there was a sharp deterioration in liquidity, which was associated with a sharp rise in some measures of yield curve fitting errors to a peak of about 20 basis points. This compares to less than 2 basis points prior to the crisis. 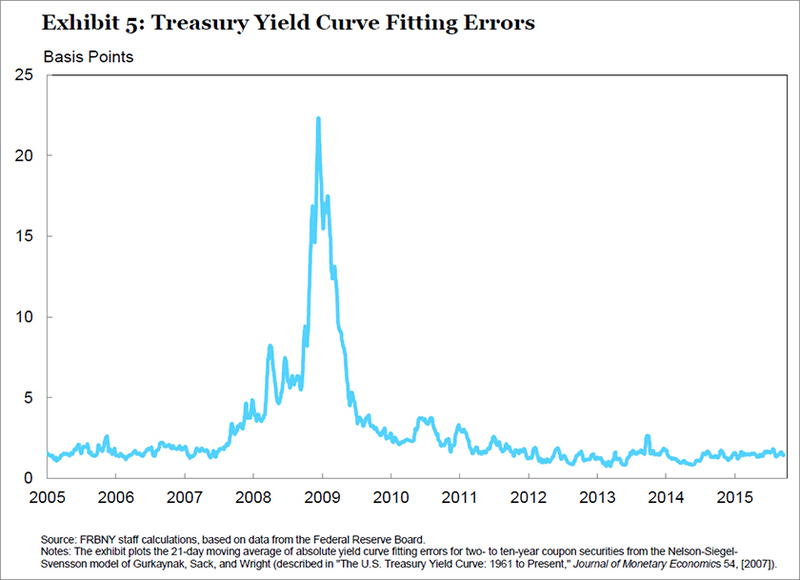 In contrast, yield curve fitting errors have been low and stable recently and not outside historical norms. (Exhibit 5) Of course, the Federal Reserve's large scale interventions in the Treasury market over this period may also have had an impact on this measure. 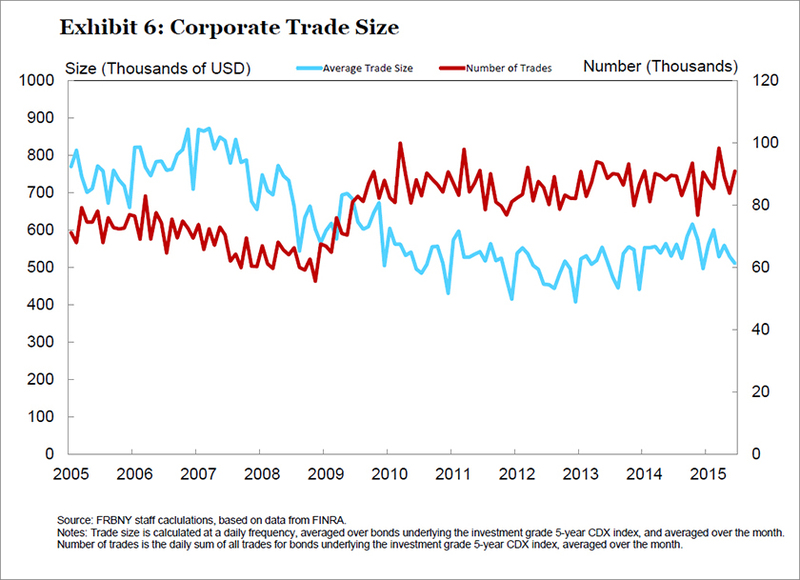 Turning to corporate bonds, given their heterogeneous nature, liquidity in the corporate bond market depends on the ability and willingness of dealers to hold these securities on their balance sheets while they find buyers. Disaggregated data on dealer balance sheet holdings have only been published since April 2013. While limited in terms of its history, these data indicate no clear reduction in investment grade security holdings over time, but do show a significant reduction in high-yield security holdings since the end of the financial crisis. This might be indicative of deterioration in market liquidity in corporate bonds. In sum, there is limited evidence pointing to a reduction in the average levels of liquidity. 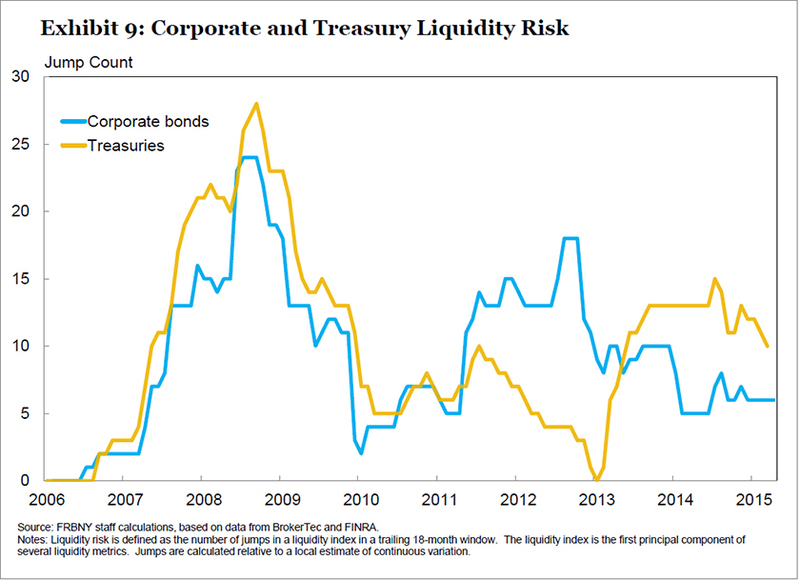 However, there are reasons to think liquidity risk may have increased, and there are some data to support this conjecture. Two cautionary notes are warranted in evaluating the available evidence. First, the Treasury market evidence is based on the inter-dealer markets, and we do not have comparable evidence on liquidity conditions in the dealer-to-customer market. Second, it is important to note that the FOMC's unconventional monetary policy may have affected recent measures of liquidity in ways that could make it more difficult to clearly discern any potential changes. To the extent that this may be the case, then a clearer picture on liquidity conditions may only emerge as monetary policy is normalized. What factors could influence liquidity provision? Clearly many factors could affect liquidity provision. On the regulatory side, capital and liquidity requirements are probably the most important factors. Dealers have been an important provider of liquidity. Higher capital requirements reduce dealers' returns on equity for a given level of intermediation activity and margin. At the same time, liquidity requirements increase the cost of holding less liquid assets. To compensate for the higher capital and liquidity requirements, dealers can shrink their activity in lower margin businesses and raise the price for the liquidity services they provide. Presumably, both adjustments occur in most markets with the ease of entry, the degree of economies of scale, business model and overall client profitability influencing whether the adjustment occurs more through a resizing of the activity or a change in unit trading margins. For the U.S Treasury market, the most important change in regulatory requirements is probably the introduction of the supplementary leverage ratio (SLR) in the United States. The SLR limits how leveraged a dealer balance sheet can be. Because in the SLR all assets require regulatory capital, the SLR is much tougher on low risk assets compared to the risk-based capital measures it complements. Of note, the long-standing U.S. tier 1 leverage ratio also requires the same amount of regulatory capital for all assets, but the SLR has been more binding given its higher calibration and more expansive coverage of exposures. The SLR is currently the binding capital requirement for some dealers, and it has significantly increased the amount of capital that needs to be held against low-risk assets. This has resulted in significant adjustments in the composition of dealer balance sheets. For example, the imposition of the SLR has been cited as an important factor in the shrinkage of dealer repo financing activity. In contrast, the risk-based capital standards and new liquidity standards are unlikely to be important for Treasuries and repo backed by Treasuries because Treasuries are treated as posing less risk to the banks that hold them and count as high-quality liquid assets. 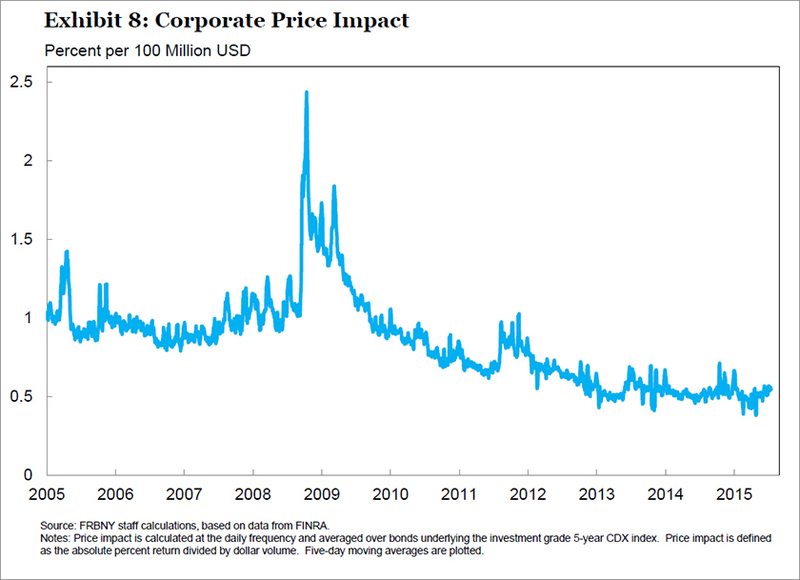 For the corporate bond market, the most relevant factors are probably the increase in the Basel risk-weighted capital ratio, the Comprehensive Capital Analysis and Review (CCAR) stress tests—which subject the dealer trading book to additional global market shocks that include a sudden increase in general risk premiums and credit risk combined with significant market illiquidity—and the Volcker Rule, which prohibits proprietary trading for a number of asset classes including corporate bonds, but not U.S. Treasuries. 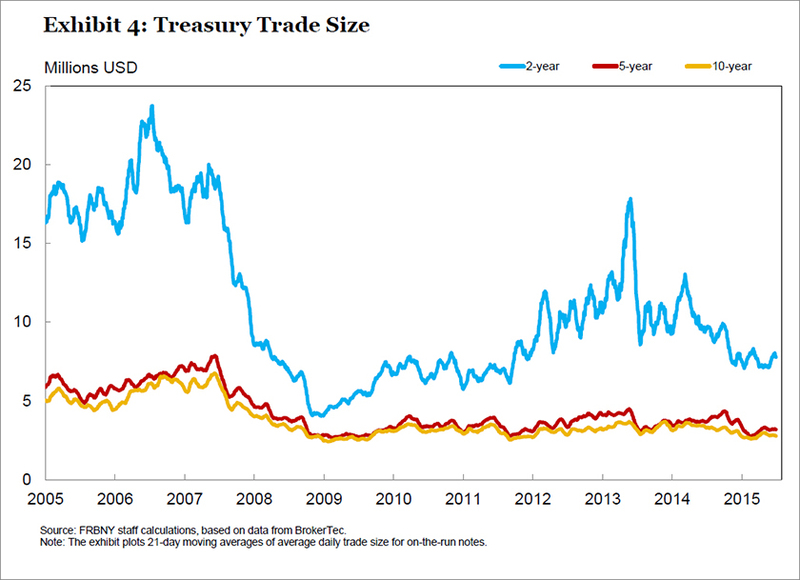 Liquidity risk in the Treasury market may also reflect the growth in high-frequency trading rather than the impact of regulation. Temporary illiquidity events may reflect unanticipated, complex and dynamic interactions among high-frequency trading strategies that can play out faster than the timeframe in which human intervention can occur. In addition, high-frequency trading activity, by undercutting the returns to providing liquidity services on a lower frequency and a higher trade size basis, may have both increased liquidity in the small—hence narrowing bid/offer spreads in normal trading conditions—but decreased it in the large—when selling or buying pressure on one side of the market predominates. For the corporate bond market, market structure has also changed in important ways. For example, bond mutual funds and exchange traded funds now hold a much higher proportion of corporate bonds than before the financial crisis. Presumably, this shift in the structure of the market has affected liquidity provision and liquidity risk in the corporate bond market through the redemption risk faced by these funds. Also, shifts in market structure and regulation have undoubtedly affected other markets related to the corporate bond market. For example, changes in capital requirements for single name credit default swaps have presumably—and appropriately from a supervisory perspective—increased hedging costs and affected dealer market-making appetites and capabilities. What are the costs associated with shifts in liquidity and how do these costs compare to the benefits of a more resilient and robust financial system? Even if one were to read the evidence as supporting the notion that liquidity has become somewhat more costly, this does not imply that we should simply unwind recent regulatory requirements. First, as I discussed, there are non-regulatory factors that could be more important factors. Second, even if a connection could be made to regulatory causes, the costs of any reduction in liquidity or increase in liquidity risk might be low relative to the benefits of the regulations. As I see it, the prior regime did not sufficiently foster financial stability, a necessary condition for sustained economic growth. Most noteworthy to me is the fact that the regulatory regime that was in place in 2008 and 2009 was associated with an episode of the most illiquid market conditions since at least the Great Depression. A return to such a regime could lead to a higher cost for liquidity over the long-run. I think we are in a much better place today. We have a financial system that is much more resilient, and the available evidence suggests that this transformation has not resulted in any significant erosion in market liquidity. What future work is needed? There is a tendency to compress a complex world into a sound bite—such as, "tougher regulation is increasing the cost of liquidity and driving up liquidity risk." Policy needs to be based on evidence and the available evidence supporting this claim is mixed, at best. Most importantly, I think it ignores the complex nature of the changes underway in financial markets. The methods of intermediation are changing and will likely continue to evolve. There are new players with different objectives and goals, and technology is evolving rapidly. These factors strike me as just as important as the increase in regulatory requirements for the large dealers. The recent work analyzing the October 15 Treasury market flash rally illuminates the complexity of today's market structure. After a careful examination of the evidence, the authors of the October 15 flash rally report conclude that "the events of October 15 underscore the importance of efforts by the official and private sectors to understand more fully the implications of the evolving Treasury market structure for liquidity, trading and risk management practices, data access, and monitoring and surveillance." The report goes on to suggest "further study of the evolution of the U.S. Treasury market and the implications for market structure and liquidity;" "continue monitoring of trading and risk management practices across the U.S. Treasury market;" "an assessment of the data available to the public and to official sectors on U.S. Treasury cash securities;" and "continued efforts to strengthen monitoring and surveillance and to promote interagency coordination related to trading across the U.S. Treasury market. "4 I concur with all these recommendations. whether financial market regulation could be altered in a way that improves the balance between the benefits of tougher regulation in terms of enhanced financial stability versus the costs of such regulation, including any adverse impacts on market liquidity provision. In addition, whether microstructure reforms aimed at improving the functioning of markets could be promising in that respect. We certainly don't want to undermine the progress we have made in making the financial system more robust and resilient. But if there are adjustments to regulation that could improve liquidity provision without increasing financial stability risks, we should be open to considering such changes. I suspect, however, making this determination will require considerably more data, research and reflection before we reach any definitive conclusions. 1 Tobias Adrian, Dianne Dobbeck, James Egelhof, Michael Fleming, Joshua Frost, Lorie Logan, Michael McMorrow, Matthew Raskin, Ernst Schaumburg, Katherine Tilghman-Hill, Joseph Tracy and Nathaniel Wuerffel assisted in preparing these remarks. 2 The Federal Reserve's large scale asset purchases presumably have also played a role by removing a large volume of Treasury securities from the marketplace. 4See Joint Staff Report: The U.S. Treasury Market on October 15, 2014, pp 6-7.